Preheat the oven to 400°F. 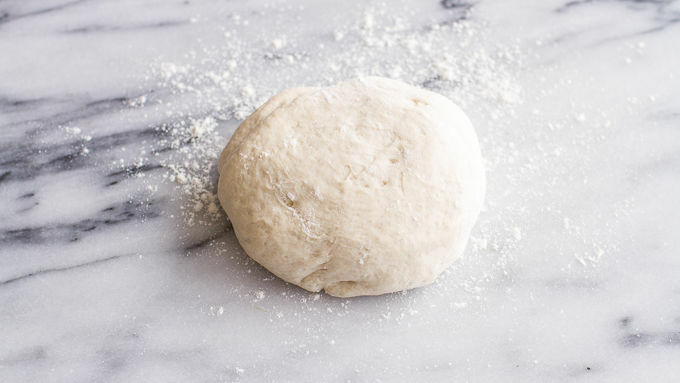 Unroll the pizza crust dough and shape it in into a ball. 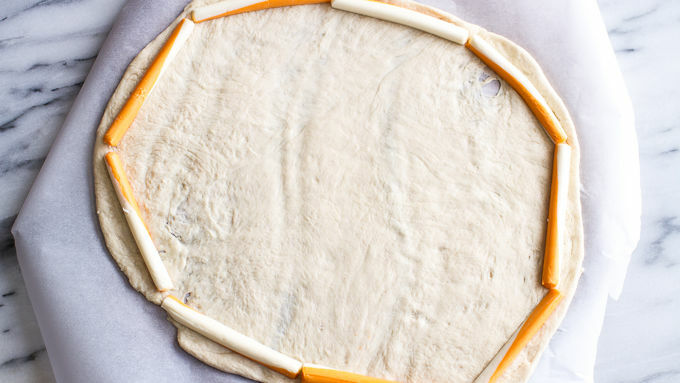 Allow the dough to rest 5 minutes and then roll it out into a large circle. Slice the cheese sticks in half lengthwise and place them around the edges of the pizza dough. Roll the edges up and over the cheese, pinching the dough to seal in the cheese. 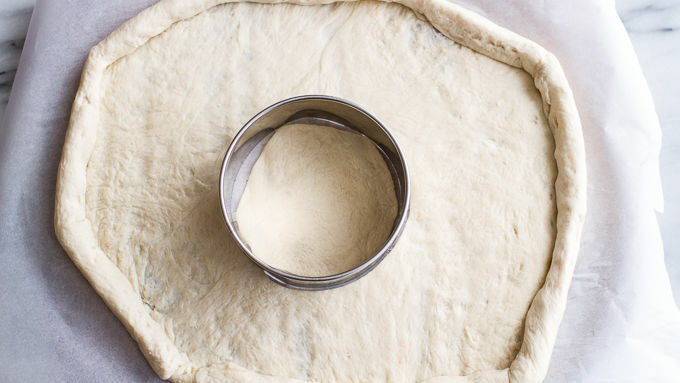 Using a large 4-1/2 inch circle cookie cutter or a sharp knife, cut a circle out of the middle of the dough. 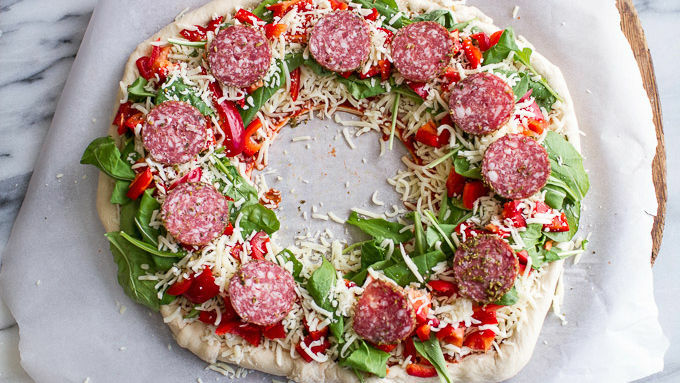 Use the leftover dough to fill in any thin spots around the wreath. Spread the pizza with sauce and then sprinkle with cheese. Add the arugula and diced red and green peppers. Sprinkle with a little more mozzarella cheese and then add the salami slices. Bake for 25-30 minutes or until the cheese is melted and bubbly. While the pizza is baking, cut slices of the remaining red pepper in strips and arrange them in the shape of a bow. Garnish the pizza with fresh arugula and Parmesan cheese. Place the pepper bow at the top. Serve with balsamic vinegar, ranch dressing and extra pizza sauce if desired. Customize the veggies to your liking: sun-dried tomatoes, zucchini, jalapenos, spinach, pepperonis and green olives would all be awesome. An easy refrigerated crust is dressed with red and green fixin's. As you can see, I have fully immersed myself in the holiday sprit – and I couldn’t be happier about it. This is my favorite time of the year! All you scrooges out there should probably just look away now, because… it’s time to talk Christmas food. YES!! This is probably one of the most festive recipes I have, and wow, it’s so fun, so good and super easy to make. It's ridiculously perfect for all those holiday gatherings this time of year. PLUS, it doubles as a beautiful holiday centerpiece. I mean, how perfect is that? 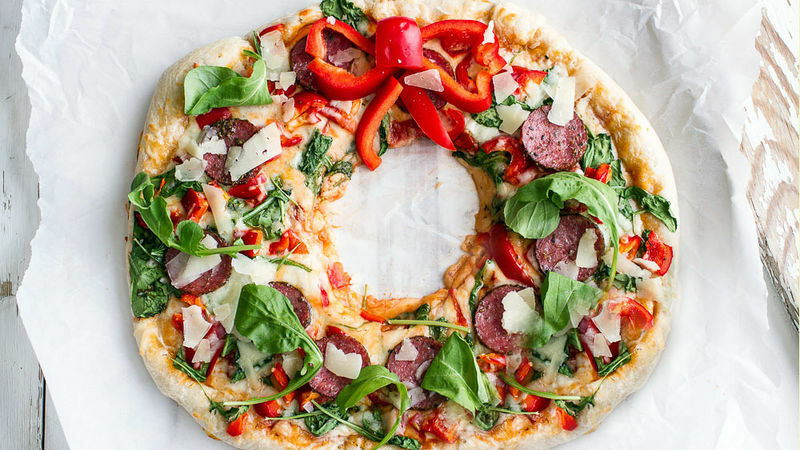 You can really flavor this pizza any way you like, as long as there’s plenty of red and green going on. I used pizza sauce, arugula and red and green peppers, but pesto, sun-dried tomatoes and spinach would be awesome as well. 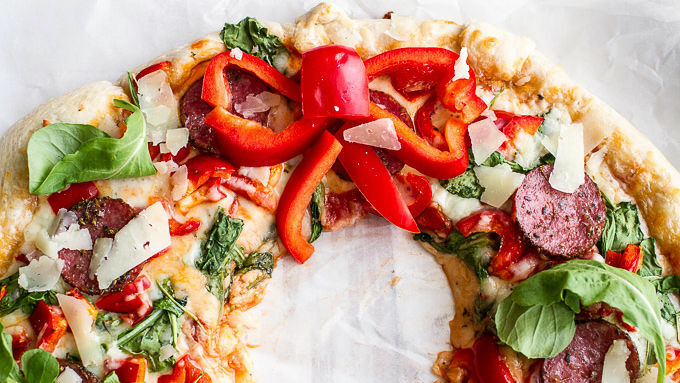 Garnish the pizza with fresh arugula and Parmesan cheese, and add a red bell pepper bow at the top. 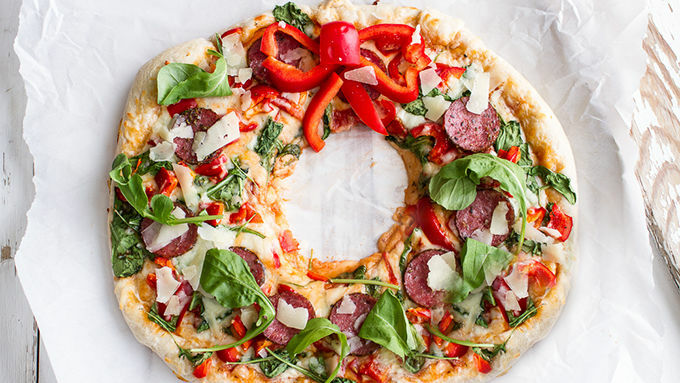 And that's how to dress a pizza for the holidays!